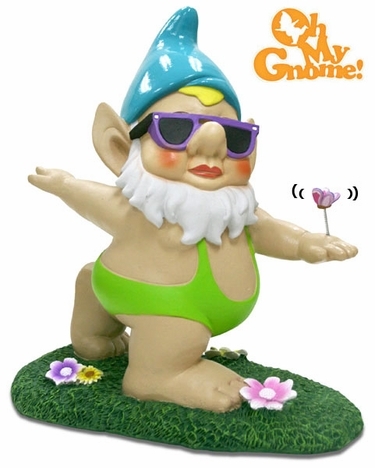 Home > Miniature Gnomes > Garden Gnomes > Beach Gnomes > Butterfly Mankini Gnome - OMG! Known as "Gnomesicle" or the Butterfly Whisperer, this stretching OMG garden gnome will stop at nothing to keep your garden butterflies entertained! When the first samples of our new OMG Butterfly Mankini Gnomes, the entire office literally froze in loving hysterics! Size: 11.75"H x 10.5W x 6"D. Durable Poly-Resin w/protective finish. Sweet Butterfly on Flexible Spring. Solid base for Outdoor Enjoyment or Indoor Display. A Must-Have addition to any Unique Gnome Collection!